Rumors and speculation are about to come to a head. Apple has announced it will indeed hold a special media event on September 12 in San Francisco. The event will take place at the Yerba Buena Center for the Arts Theater, beginning at 10 a.m. Pacific/1 p.m. Eastern. 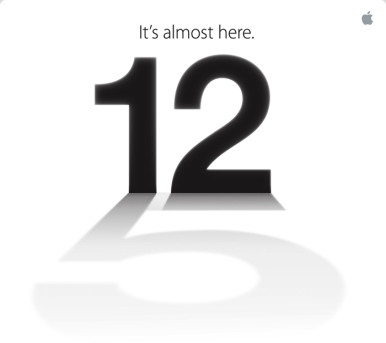 The invitation received by Macworld features the text “It’s almost here” along with a large number 12 casting the shadow of a numeral 5, which would seem to lend credence to suggestions that Apple will be announcing the iPhone 5. The company’s also likely to discuss iOS 6, which it first announced at its Worldwide Developers Conference in June and is due for release in the fall. Plenty of whispers about the iPhone 5 have been circulating in the past months, and many of them have centered around a September 12 event. Among the most pervasive rumors have been a phone with a larger display, the addition of LTE networking, and a new dock-connector port. In about a week, we’ll see which of these rumors are true and which are dead. Macworld will, of course, be on hand with live coverage of the event as it happens, along with plenty of followup analysis and opinion. Stay tuned.